ORANGE IS THE COLOR OF THE DAY est le cinquième volume de la série « Campagne », une série couvrant l’engagement des parachutistes américains au cours de la libération de l’Europe. Cet ouvrage raconte à travers un recueil de photographies d’époque, l’épopée des parachutistes américains de la 101e Airborne au cours de la libération de la Hollande de le cadre de l’Operation Market-Garden. « Orange is the Color of the Day » continues where the first volume, titled « D-Day Minus – 17 September 1944 » stops. 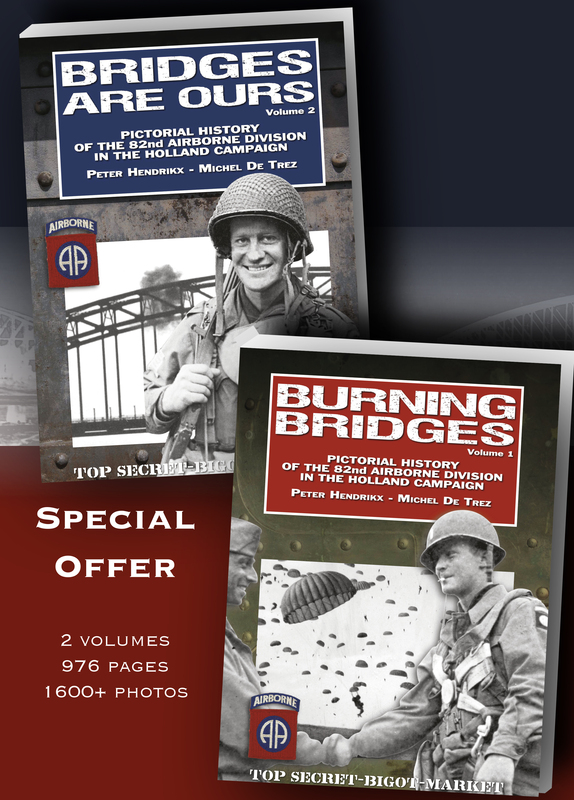 The book is a valuable addition to the existing literature about Operation Market Garden and the 101st Airborne Division, because no other unit in any given battle in any war received such extensive coverage as the 101st gets in this book. Even those who have been studying the 101st Airborne Division for many years and believe the have read all there is to it, will discover many new facts about the great achievements of the « Screaming Eagles ». So the entire combat history of the 101st Airborne Division in Operation Market Garden is covered, from the day they boarded their C-47s and WACO gliders at the airbases in England on September 17, 1944, to the moment they were relieved after 72 days of continual combat on November 27, 1944. However, aiming to be complete, the book was getting close to 775 pages and out of sheer necessity it was decided to cut the book in two and publish two volumes. Only the two volumes together tell the complete story. Like a kite string, the complete story of the employment of the 101st Airborne Division is told in photographs and elaborate captions. No single major action has been omitted. And where no photographs or stills were available to complete the story, new chapters were written based on prime sources such as after action reports, combat interviews and veteran stories. For this pictorial history, special attention was given to the quality of the photographs… and like you have come to expect from D-Day Publishing books: « No Small Photograph Prints. » Furthermore, the great majority of the photos are digital copies of the first, original print. The density and contrast have been digitally improved, so in many cases the quality is even better than the original print. If photographs were not available stills from Signal Corps footage were used with surprising results. The authors were also able to scan original 120mm and 35mm negatives of local Dutch photographers, which resulted in an even better quality and detail. The introduction addresses the combat role of just the 101st Airborne Division within Operation Market Garden. 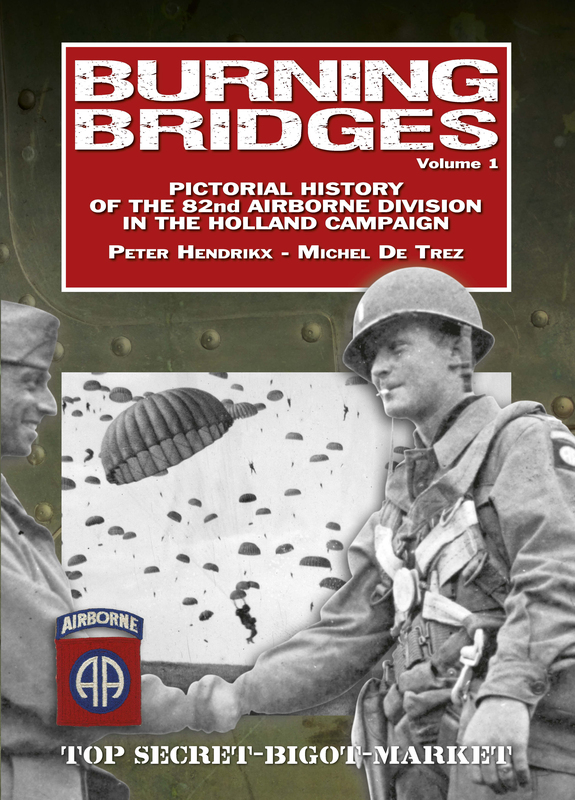 The first two chapters show the most extensive photo coverage of any airborne operation ever of the drop zones and landing zone near Heeswijk, Eerde and Son. Both the parachute drop and glider landings are well documented. Next, all combat operations are divided by the geography of the towns and combat areas instead of by chronological sequence. Immediately after the landing, the next chapter is about Son and the Division Service Area. The capture of the Son Bridge and the activities of the glider pilots in the Division Service Area are dealt with in this chapter. The following and largest chapter is about the 506th PIR and the liberation of Eindhoven. In great detail the fight for the German 88mm guns in the north, the capture of the Dommel bridges and the celebrations by the happy Dutch are shown. Also the actions of the reinforced 506th RCT east of Eindhoven are shown and described for the first time. « Band of Brothers » fans will love this chapter as the authors uncovered many new photographs of the men of Easy Company in Eindhoven. The next chapter is about the heavy fighting in Best and the Son Forest, where the 101st fought one of the heaviest battles of the entire war. The 502nd PIR and the 327th GIR in the Son Forest, the POW’s and the amazing story of Medal of Honor recipient Joe Mann is well described. The next chapter follows Hell’s Highway into St.-Oedenrode. The actions of the 502 in St.-Oedenrode and the road cut by the Germans will be discussed in this chapter. The following chapter is about the heavy fighting by the 501st Regiment in Eerde and Schijndel. Thanks to the regimental photographer, Eerde is well covered for such a small village. Next in line is Veghel. After Eindhoven, Veghel was the second most photographed town that was liberated by the 101st. The capture of the bridges by the 501st and the subsequent celebration of the liberation will be shown through many photographs. Also the defence against the Germans and the medical support of the 501st is dealt with in this chapter. Few photos were taken in Uden, but an American officer took exceptional photos in its immediate surrounding. After Operation Market Garden was over, the 101st Airborne Division was not relieved as agreed upon, but instead served almost two months as regular infantry south of the Rhine near Arnhem. Many rare photos show their ordeal on the Island. The last chapter is about the Medical Support of the 101st Airborne Division. The story of the unsung heroes of the medical service is told based on original documents and many rare photographs. 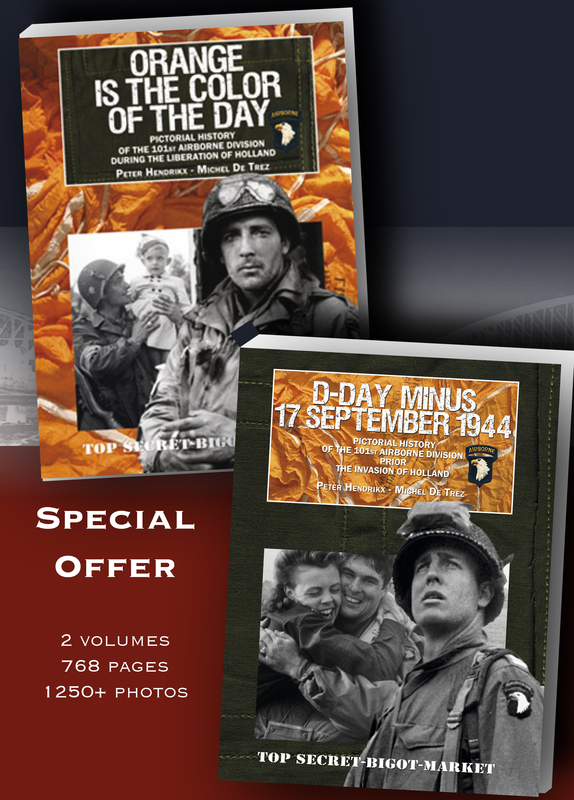 Together with the first volume, titled « D-Day Minus – 17 September 1944 », this volume offers a never before published insight in the history of the 101st Airborne Division in the Holland campaign. 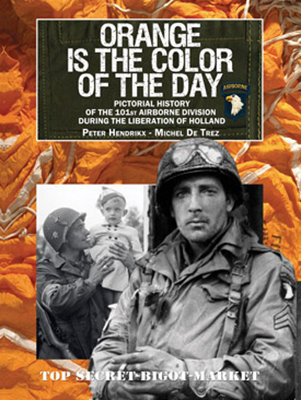 Michel De Trez and Peter Hendrikx, who each have been studying airborne history for over thirty years, put together the most complete pictorial history of the 101st Airborne Division in the liberation of Holland with 1,250 photographs, of which the great majority has never been published before. All photos are identified either by date, location, name of individual soldiers, equipment or historical context. Often all these leads have been identified. This resulted in very informative and extensive captions. Rare airborne equipment, documents and artifacts from December44 and D-Day Experience museum’s collections are spread throughout the book where it is relevant.